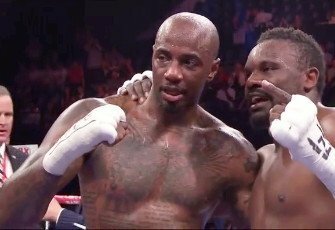 American Malik Scott (35-1-1, 12 KO’s) was on the receiving end up a terrible, terrible 6th round stoppage against Britain’s Dereck Chisora (17-4, 11 KO’s) tonight at the Wembley Arena in London, UK. Scott hit the deck in the 6th after getting hit with a looping right hand that hit him in the back of the head. Scott stayed down on his knees until the referee counted to 9, and then Scott got back to his feet. The referee halted the fight anyway much to the shock of Scott, his team, as well the British fans. It looked like the referee might have been confused in the amount of fingers he was holding up because Scott was clearly on his feet at the count of 9. The referee had 9 fingers held up as Scott got to his feet, yet the referee halted the fight anyway. It was a real buzzkill for the British fans, because they didn’t do much cheering because of how it ended. After the fight Scott asked for a rematch, but that doesn’t look like it’s going to happen anytime soon. Chisora was talking about wanting to fight one of the Klitschkos. Good luck trying to make that happen. Chisora isn’t even ranked in the top 15, and he’s still lost 4 out of his last 7 fights. I just don’t think Wladimir Klitschko or his brother Vitali Klitschko are going to revisit a fight against Chisora. That’s probably never going to happen unless Chisora earns the shot the hard by beating a number of top contenders to get the shot. Scott was a fringe contender, not a top guy, so the win isn’t going to put Chisora in position to get another title shot. Chisora might as well fight Scott again because who else is he going to fight if not Scott. David Haye and Tyson Fury already beat him, and David Price won’t take the chance now that’s lost his last fights. What are we talking about here. Chisora fighting the likes of Tom Dallas or Sam Sexton? He should do the right thin and clear up the controversy that surrounds this fight.